Well, it doesn’t look like The Walking Dead Season 5 wants to linger too long on any one story. Bob’s Burgers may have had it’s grand opening in The Walking Dead Season 5 Episode 2, but that barbecue was quickly closed after some tainted meat. That and Rick put the cannibals out of business for good in a bloody church massacre. I’m almost surprised the Terminus people were eliminated so quickly, though I’m also kind of glad as well. I’m not sure we could have gotten any more out of that particular group, even if they were disgustingly creepy while chewing on Bob. 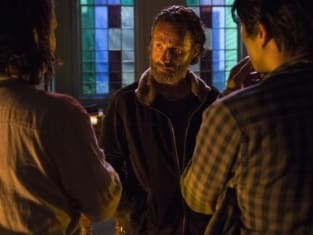 But I was more surprised that Gareth met the swift hand of Rick’s machete (which was the weapon Rick promised to use on him in The Walking Dead Season 5 Episode 1) mostly because the actor who played the cannibal leader, Andrew J. West, was promoted to series regular back in April. So I guess I assumed he would have found another way to escape and potentially run into the group again. Except, that already pretty much happened with the Governor’s storyline, and unfortunately that felt like it was drawn out too long. So it was certainly a nice way to keep viewers on their toes by eliminating Gareth, but I also was pleased that the character had managed to leave his mark and get some solid backstory about what made him the way he was in the short span of time we got to know the character. Gareth definitely made his scenes count. But if you go up against Rick, especially this new version, it’s not going to end well. And I really like how focused Rick is from setting up the trap to killing Gareth. He knew there was no way he could let someone like Gareth go, especially after having his experience with the Governor. It was interesting though how suddenly Abraham wanted to move out and go to D.C. with the threat of Gareth closing in. I know that’s all he seems to talk about, but he was ready to not only abandon the large group but even fight it to do so. At the same time, the group was just reunited, and then they split up again. I guess compared with other seasons, the story is definitely moving itself along, even if I wish the crew stayed together at least a little longer. It was good though to see the reveals of Gabriel’s story (turns out the guy is pretty much a coward) or Bob was bitten weren’t dragged out either. They easily could have been. The concept of tainted meat was intriguing, even if nothing really was explored beyond the Terminus people trying to spit it out. And with everyone already infected technically, does eating that tainted meat do anything more? Either way, it gave Bob a good laugh and surprised the sure-of-himself Gareth. I was bummed to see Bob go, considering we really only just started getting to know the guy. I had a feeling after he had all that dialogue in the previous episode that his time was coming, but there was also something to be said for how positive he was until the end. He reiterated that concept of good and hope beyond the nightmare that the survivors are struggling to live in. It makes me feel like perhaps Beth is alive and well? That definitely looks to be the direction the show is headed into focusing for next episode (D.C. is just going to have to wait a bit longer). 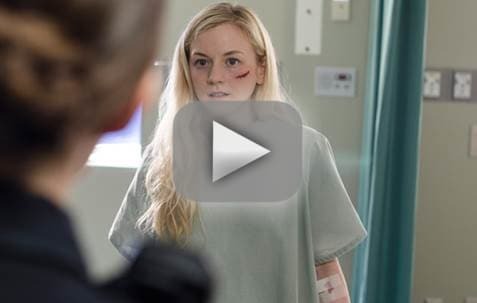 Is Beth alive? Will we get flashbacks? And yet I can’t help but feel something is wrong (Carol better be OK) after Daryl showed up to see Michonne at the close of The Walking Dead Season 5 Episode 3. Those were not happy faces at all. Overall, it feels like things are moving right along, looking not to drag things out, and it makes me both curious and excited where The Walking Dead Season 5 might be headed now that the cannibal story of hunt or be hunted seems to be done. And just who might Rick and his people have to face next? Remember all the good times with Bob and all the food times with Gareth when you watch The Walking Dead online. And be sure to comment below with your thoughts on the episode!